The Correlation Coefficient is a measure of the price relationship between 2 instruments. The CC is positive when the instruments prices move in the same direction, negative when they more in opposite directions. The range is -1 to +1. The correlation coefficient measures the degree to which 2 instruments’ movements are related. A correlation of -1.0 means perfect negative correlation, and 1.0 is perfect positive correlation. When 2 instruments’ movements mirror each other, they are positively correlated. When 2 instruments move in the opposite direction to each other, they are negatively correlated. This statistic is useful in various ways. For example, it is used to diversify a portfolio; if all the stocks, mutual funds or ETFs have high positive correlation, the portfolio is hardly diversified. By adding a negatively correlated asset to the mix, diversification benefits are realized. In currency trading, taking positions in 2 instruments that are highly correlated will have a positive affect if the direction is correct and a negative affect if the direction is incorrect. By having positions in 2 instruments that are not so highly correlated, the two together will moderate both gains and losses. If avgV1 = average price of instrument1 for the period, avgV1Sq = average of V1*V1 for the period, avgV1V2 = average price of V1*V2 for the period, var1 = avgV1Sq – avgV1 * avgV1, covar = avgV1V2 – avgV1 * avgV2; Then: CC = covar / SquareRoot (var1 * var2). 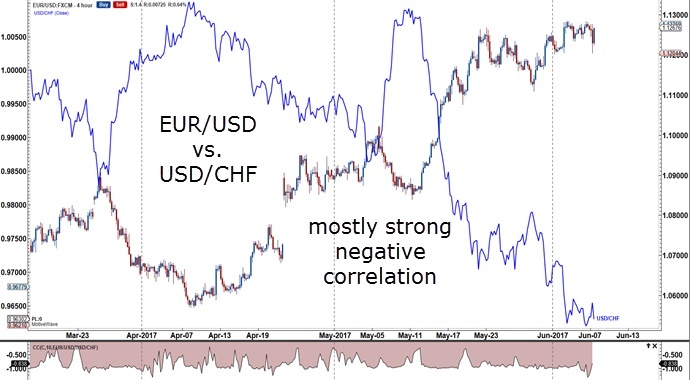 Currency Example 1: The EUR/USD vs. USD/CHF has high negative correlation for the most part. In the 4-hour chart below, the USD/CHF is overlayed on the EUR/USD candlestick chart, with the correlation coefficient below. Most of the time the 2 instruments are highly negatively correlated (close to -1) but one can observe that there are times where the correlation dips to -.5 and below. One can also see this by looking at the EUR/CHF chart below. 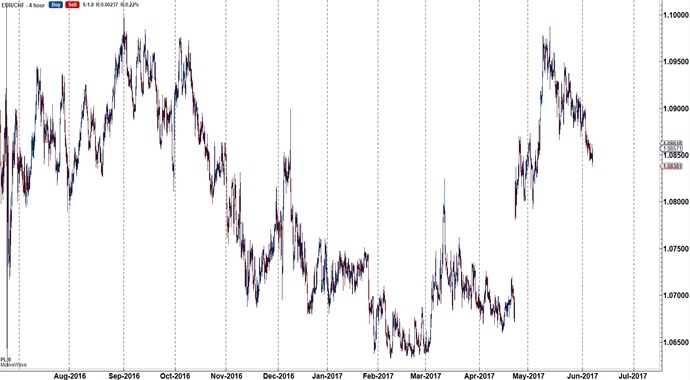 A perfect negatively correlation would show the EUR/CHF cross constant, but there are times when the EURO strengthens vis-à-vis the Swiss Franc and vice versa. When looking at currency correlations, also have a look at the cross itself. 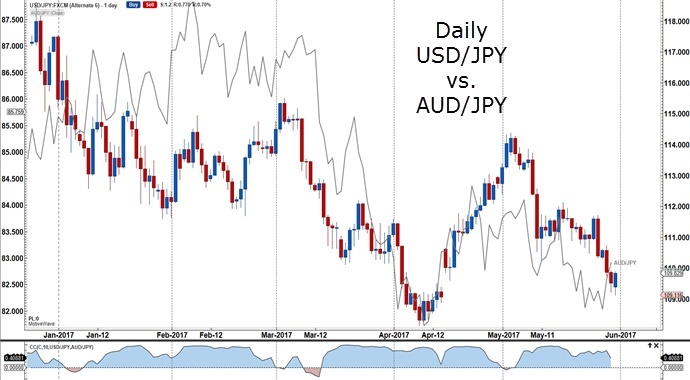 Currency Example 2: The USD/JPY vs. AUD/JPY is positively correlated, meaning, when the USD/JPY goes down, so does the AUD/JPY. In the daily chart below, the correlation coefficient ranges between 95 and 0, briefly going into negative territory. What this means is, a trader should look at the USD/JPY when trading the JPY crosses, and a comparison of all the JPY crosses will show which are more highly correlated with the USD/JPY. The chart shows the USD/JPY candlesticks with an AUD/JPY overlay, which confirms the positive correlation. 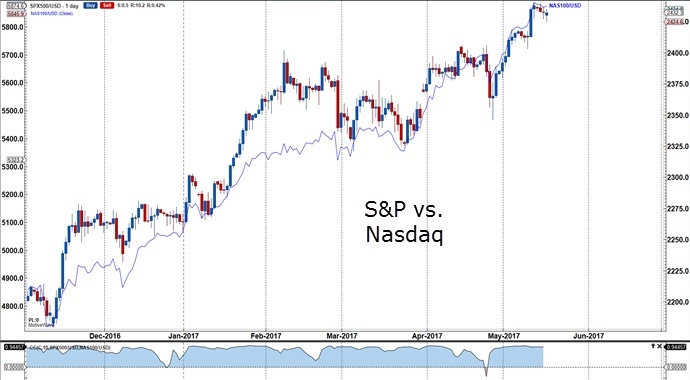 Stock Example 3: The S&P500 vs. the Nasdaq100 are highly correlated, as depicted in the chart below, with the Nasdaq overlaid on the S&P. With the markets so highly correlated, buying both indexes would not create a diversified portfolio. This is one of the ways that the tool can be used, to see how markets trade with one another. It is a form of stress testing a portfolio. Learn how the Correlation Coefficient can be used as a tool to see how exposed a trader’s portfolio is when talking multiple positions on different markets. Start incorporating the Correlation Coefficient into your chart set-up. Finally, use the Correlation Coefficient to diversify a portfolio. See you next week for a “D” indicator! This entry was posted in Trading Tips and tagged Correlation Coefficient, forex, forex trading, forex trading online, swing trading, trading, trading plan, trading strategy, trading system.